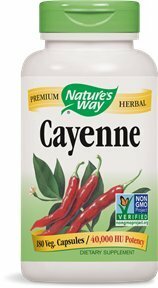 Cayenne Pepper (Capsicum annuum) fruit is a warming herb that has an invigorating effect. Special blending guarantees 0.25% capsaicin with a consistent potency of 40,000 H.U. (Heat Units). Our Cayenne is carefully tested and produced to superior quality standards.